Not to sound like an ad here but insert coin is a pretty great videogame clothes store. The designs they have are subtle and never too in your face or pointlessly meme filled, which makes their new team-up with Sega pants jizzingly amazing. 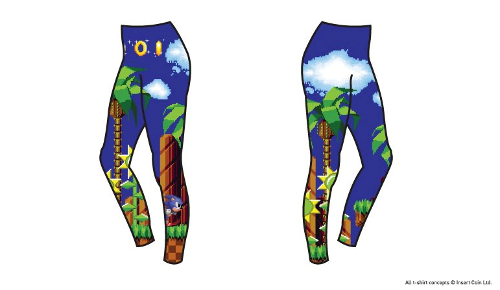 They have had previous Sega inspired shirts on their site before but this upcoming range will introduce new awesome items such as several Sonic shirts and hoodies, a Space Channel 5 vest, and some bizarre Sonic leggings (viewable above). You can view the rest of the designs on their recent blog post here. Pretty awesome stuff per usual and I’m definitely looking forward to seeing what this range looks like in cloth when they release these new designs later this year. Best Buy Spoils New Persona 4 Arena Ultimax Characters? Daytona USA gets first trailer, 8-Player Multiplayer!